So, the recap of our Novice debut begins! We arrived at the Carolina Horse Park much later than I originally had hoped for Friday evening after a day of utter chaos, but I was able to eek in our ride, which was 20 minutes free walk-medium walk transitions plus a little trot and canter, before the light ran out. Saturday morning because of the timing I opted to do Jack’s pre-ride instead of hand walking, because it seems to settle his brain much more to have a job. So we meandered along the track of the warm up ring for a solid 10 minutes, followed by 5 min of free walk – medium walk transitions, then trot-walk transitions and a canter circle in each direction before going back in. The pre-ride seems key for Jack, and when we went back out to the warmup ring before the actual test he felt much more relaxed. 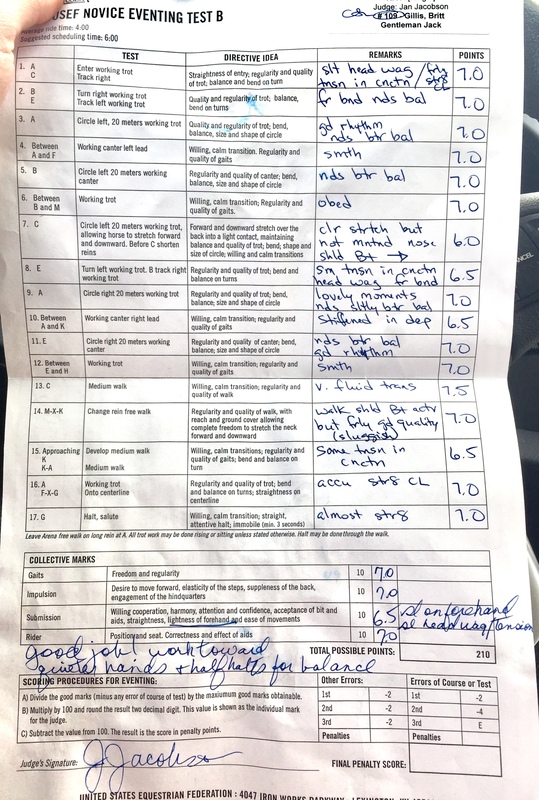 We repeated much of the routine from earlier in the day, with a focus on energy and straightness, and with him feeling ace we headed into the dressage ring. Overall I’m thrilled with the test. He felt so relaxed that I was finally able to ask for more energy in the trot. This in itself has been a big goal, as we’ve been keeping his trot small and relaxed in the show ring to be a little risk-aversive. If we had pushed for a bigger trot before he was really relaxed, we always had moments of tension, hollowing, or breaking to the canter. This time I could put my leg on and not get an anxious tail swish or hollowing. Eventually I think I can ask for an even more forward trot, but this was a solid milestone for us. Great job! It’s so fun to watch you and Jack growing as a team. Who cares about the number at the end of the day – it’s one person’s opinion and it sounds like you guys made some real progress! He looks great and so, so relaxed! That really was a lovely test! He sure looks relaxed at the trot, too, so yay for confidence and improvement! Congrats! What a lovely test! He does look so relaxed. a 31 from Jan is pretty damn good!!!! If I remember correctly she’s a pretty tough judge? Do you think she remembers you from the Team days? Either way awesome that you seem to have a good plan for dressage!!! That’s a great looking score sheet. Congrats!